We know many PPL patrons are eager for our Burbank Branch to reopen – we are, too! We will set the reopening date very soon, and we look forward to announcing it as soon as possible. We can’t wait to celebrate with you once we are back in the building. Below are responses to the most frequent questions we are hearing about the current status of the renovation project. If you have feedback or other questions we can answer, please call PPL’s Administration Offices at 207-871-1700 ext. 756. I see lots of activity at the Burbank Branch site. How is it going? We have encountered only minimal construction delays, so we have been able to stay on schedule pretty well. As you can see from these photos, the new elevator is installed, the public computing area is coming together, and the new space is open and inviting. We will begin moving our collections and furnishings in shortly. How is the project funding progressing? As we have shared previously, this is a $410,000 renovation. As is the case with every PPL capital project and our annual operational budget, the City of Portland supports PPL’s infrastructure needs. In this case, the City provided $300,000 to the project address the structural and ergonomic issues at the building. However, we rely on the generosity of private donors for everything that enhances the Burbank library experience – from our ongoing programs, to the ways we build our collections, and the project-specific items like fresh, flexible seating in the children’s and adults areas. 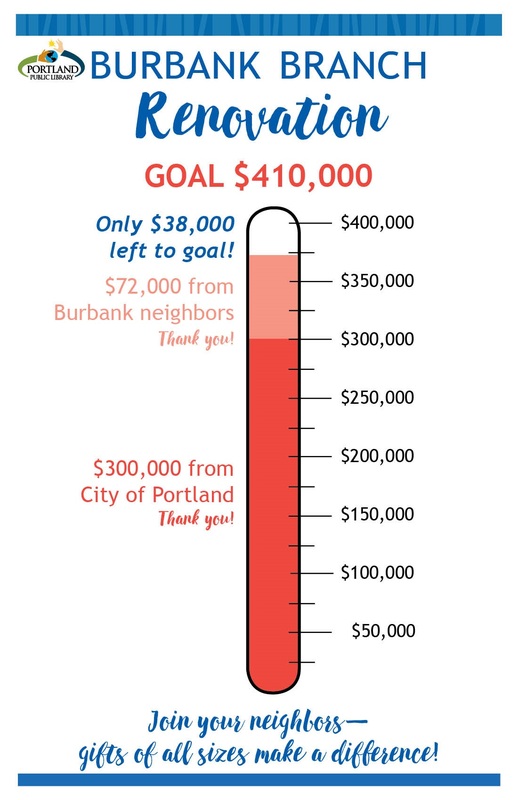 To date, we have received gifts from nearly 300 households toward the Burbank Branch renovation campaign and are now less than $40,000 away from our $410,000 goal. Does this mean the project began before the funding was secure? How does the fundraising campaign affect the reopening of the branch? Our hope is that gifts to the campaign will continue to keep pace with our renovation timeline and that we can reopen having accomplished all improvements rather than deferring any enhancements if we do not meet our goal. Please consider joining your neighbors in this effort, if you have not done so already, and make a secure gift online to the Burbank Branch renovation campaign. We are so grateful for the support of the community!